Tennessee is a beautiful state that has been known for its stance against fascism. In fact, the city in question, Athens, Tennessee, named after the classical Greek city, was once the site of a successful armed citizen revolt in 1946 when the police force tried to close down the polling stations and beat up citizens. The people who took up arms and started shooting back successfully defeated the government forces, reinstated the elections, and were never prosecuted for their resistance. However, it seems that in 2018, many citizens of Athens have forgotten their legacy of securing a free state. When a local citizen, Angela Wilson, an ArchDruid, announced that she would be hosting and leading a public Samhain rite on October 27th, Christian church groups and individuals bombarded her with hate messages. They desired to do whatever they could to halt the religious freedom of the local Pagans, by whatever means necessary. The threats became so serious that the local government intervened and stated that they would be sending a police presence to protect the Pagans and their religious rights. The fear that violence could break out at some point was even entertained. 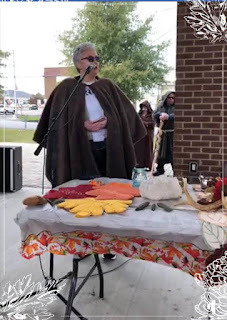 Many of us in the Pagan community, including myself, came together in support of the Athens Pagans and spoke many prayers for them. I myself asked Athena to protect and give them the victory over this threat. For centuries, the Pagans have been confronted with persecution in so many forms. It's time for it to end! According to Angela, around 250 protesters showed up, but the police kept them far enough away from the Pagans as to prevent interference with their religious freedom. Even the City Manager and several Ministers attended to support Angela and her group. No violence occurred, the rite was in no way interrupted; it was called an absolute success. And with the population of Athens being about 13,615, it means the protesters were utterly unsuccessful in every way. In Angela's own words, "Athens took very good care of us." I was extremely grateful to hear that the Gods and the city watched over our Pagan brothers and sisters. America herself has been no stranger to fascism, dictatorship, and persecution. There were even times when the state would actually beat down the oppressed instead of protecting them, but it seems, fortunately, that the more and more she grows, the less popular these things become. The American minority has never had an easy time, but they've eventually won their freedom and rightful places. And what the haters and protesters also didn't realize was that they gave the Pagans state and national attention to their religious rights being in danger. They brought us good even in their immoral actions. This is one more victory to put under the Pagan belt. I salute Angela and her people and hope to see more public events from them. But, most importantly, I thank you all deeply for having the courage to stand up to the hate. You didn't let them run you off. You were steadfast, and as Alexander said, fortune favors the bold. May the Gods keep you in their love and protection.